I have been travelling for my full-time job almost non stop lately, home only long enough to attend my graduate classes two evenings a week. This means that little crafting or blogging has been completed recently, so today will be random things I forgot to blog about earlier in the year. This is my haul from Rhinebeck this year, minus the amazing cheese and pesto I bought. Those are already gone. Starting from the upper left: BFL naturally dyed from Spencer Hill Spinning and Dyeing. She only uses natural dyes for all of her products, and gets amazing colors from them. Next is 4oz of baby mohair/wool from Steam Valley Fiber. The White skein is also from them; it’s a mohair/wool blend dk weight yarn. Next are two skeins of sock yarn from Spencer Hill (can you tell where I spent all of my money?) in indigo/lac and indigo. Then two miniskeins of sock yarn from Miss Babs for some colorwork mittens I am planning. Finally, 8oz of CVM/Silk from Carolina Homespun. It is like touching a cloud. I LOVE it. This was my big birthday present from my parents- an antique yarn blocker! It is fully functioning, and makes a popping noise after approximately 80 rotations (I need to count again, it’s hard to keep track). Some of the spokes are chipped, but they will still hold yarn! This Book was a present for my inlaws. I cannot wait to start making some of the projects in it. The Penguin and Alligator specifically look like so much fun. I posted back here about spinning up some pink corriedale in fauxlags. 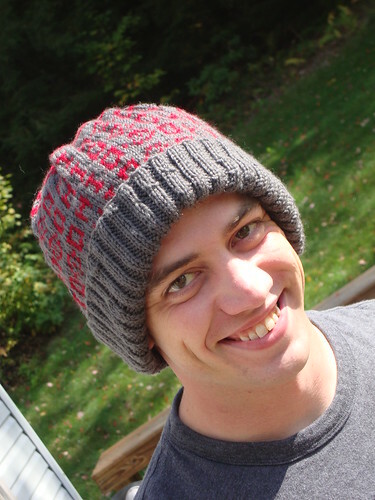 This hat is the result of that yarn. It used about 2/3 of the skein (125yds). It is so warm and squishy, I love it! I didn’t want to take it off once I finished it. 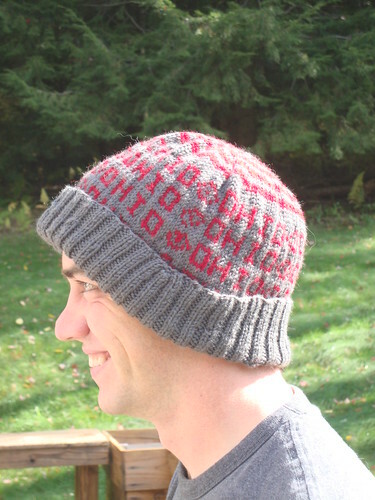 This hat only took about 3 days of intermittent knitting. It has been two months since I last blogged. I keep promising I will do it more often, then life goes crazy on me. It’s been a hectic last few weeks, here. I just registered for graduate classes, starting in the Spring. Christmas crafting and preparations are in full swing, and I have been baking and cooking up a storm to make sure we get full use of our CSA boxes. I have decided that having a specific topic to blog about, might make me blog more frequently. A lot of craft bloggers have days such as “Work in Progress Wednesay” “Finished Object Friday,” etc. Today will be Sewing Sunday! My first finished sewing item of the last few weeks: my new yoga bag! I bought some neon paisley fabric at JoAnn fabrics for half price. This project took literally 2 hours from start to finish, including washing. It was really quick and easy to do, and I have a completely unique bag whenever I go to class now! I will post a tutorial on how to make this tomorrow. The materials cost me approximately $7, including the drawstring and clip, and ribbon for the strap. My second sewing project I will share this week wasn’t fully sewing. I knit an earflap hat for my stepdaughter, but the flaps kept curling up, and wool can feel pretty scratchy to a 5 year old. So I bought some clearance remnant fleece and sewed it in! I think it’s pretty darn cute. That is it for today! Tomorrow will be a yoga mat bag blog. Wednesday I will show you all my current works in progress, both sewing and knitting. Friday will be knitting finished items, and Sundays will now be sewing finished items!